This entry was posted on Tuesday, September 13th, 2011 at 11:30 and is filed under Election 2012, GOP Candidates, Politics, Sarah Palin, Tea Party. I watched some of the Republican Presidential Debate on Monday night, and was led to one unmistakable conclusion: There is really only one candidate shaping the ongoing debate, and she’s not even officially in the race[yet.] Sarah Palin’s influence on these debates is clear, and you can see it in the topics of the questions, and the way in which the candidates respond. As candidates attempted to find a way to talk about Social Security without either frightening seniors unnecessarily as Governor Perry may have done, or by pretending there’s no serious problem, as Mitt Romney has done, it was Sarah Palin’s own much more moderate and cautious tone that came to dominate the debate. While it is true to say the Tea Party won the debate, it’s likewise clear that the themes Governor Palin has been discussing since 2008 are really the foundation of the ongoing Republican discussion. Who raised the issue of energy production? Who was the first to openly and harshly criticize QE2 and predict the effects we’ve all now witnessed? Which Republican is the only one to take on the whole of the Republican establishment in her state, and lately, in Washington DC? What all of the candidates on the debate stage Monday night hoped to do was capture the ground already occupied by Sarah Palin. Battle as they might, none of them ever reach that high footing because in fact, they’re all turning out to be poor imitators. They’re mostly good people, to be sure, but they’re trying to be that which they cannot: Washington DC outsiders. These are people, with the lone exception of Herman Cain, who are really outsiders in only one respect: They are outside the federal executive branch, but all of them, particularly the front-runners, have extensive ties to the DC cocktail party circuit. Perry and Romney seem most determined to try to occupy the ground held by Sarah Palin, but the truth is that neither can be considered a genuine Tea Party candidate, and both have thorough ties to DC elites, and both have proven reflexes to big government solutions, as the Gardasil and Romney-care examples demonstrate respectively. If you wonder who the invisible elephant in this room may be, there’s really only one answer: Governor Palin stands head-and-shoulders above the lot without being present. What has been particularly entertaining over the last few months is the concerted operations by the campaigns of several of these to convince Palin supporters that she would imminently endorse their preferred candidate. As her interview with Van Susteren on FNC after the debate demonstrates, she’s not interested at present in endorsing any of these. Instead, she continues to express her interest in seeing a lively debate in which the records of these candidates are thoroughly considered, and with good reason: Look what we got in 2008 when we didn’t examine a particular candidate closely. We might have avoided three or four years of pain if we had. Of course, there’s a good deal more wisdom to this thinking than may immediately meet the eye, but what’s most interesting about the current situation is that while none will mention it, everybody knows who the real front-runner is and has been since November 5th, 2008. These candidates clearly know it, the establishment clearly knows it, and suddenly, the electorate is discovering it too. While she hasn’t officially declared her candidacy, every one of the analysts and media pundits spend much of their time trying to guess her strategy, while spending inordinate amounts of intellectual capital trying to devise ways in which to sabotage or prevent her entry. What becomes clear as one watches any of these debates is that something is sorely lacking in the group, and what that seems to be is a sincere conservative who has the common-sense approach to problem-solving that our nation now requires. It’s not so much that any of these are truly awful as it is that the lot of them aren’t really all that energizing or unique. Their rhetoric sounds plastic and rehearsed to the extent that there’s little spontaneity in any of it. You can see the jabs coming and it’s all so thoroughly telegraphed that it’s impossible to become too terribly enthusiastic about any of them. Add to this the fact that Sarah Palin is notable by her absence, but also by her heavy influence, and what you realize is that until she makes her final decision, this race is going to lack the fire and the heart that will be needed to defeat Barack Obama in 2012. When the story of this rapidly accelerating primary season is finally written, these debates will likely be considered the pre-game show, or the warm-up act for the real debates certain to ensue after a Palin entry. What this debate has demonstrated, like all those previous, is how sorely lacking in focus and energy the contest has been thus far. 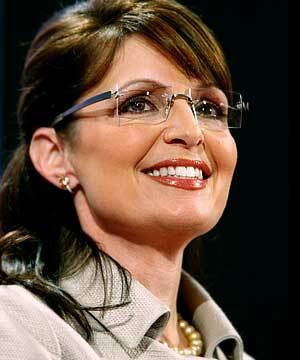 Romney and Perry seem to be the front-runners but only so long as Sarah Palin stays out. As their jabbing and counter-punching continues, the spectacle of the two smiling men begins to look rather plastic and phony. Nobody much believes either one cares for the other, but debate after debate, there they are, smiling and carrying on like the best of friends. That image, considered in the abstract, presents such a contradiction that supporters of either man are sure to catch on: This is all perfectly fake. They can make pretenses to collegial respect and comity all they like, but voters aren’t fooled, and they aren’t really impressed. After all, if they can so easily smile at one another despite the seething rancor that lies just beneath the surface of the narrow creek between them, what else do their smiles conceal? As we sprint towards Autumn, the issues are becoming clear, and the person who is continuing to shape the priorities of this debate is Sarah Palin. Her power in shaping the debate owes to the fact that she is the standard-bearer for conservative, grass-roots, Tea Party patriots, and she communicates the ideas about which they are most concerned. It seems the electorate is beginning to catch on. Excellent Mark, you hit the nail on the head. I don't dislike any of the candidates……they just don't have the whole package like Sarah, so I constantly feel let down after every debate. As an Alaskan I've seen her in action and she did so much good for this state. I pray everyday that she will enter the race….soon. Mark, I think you're right. With the possible exception of Ron Paul on domestic policy issues (his foreign policy stances – aside from the inevitability of isolationism because we can't afford anything else – are not what we need) the only thing that this gang of pretenders to the throne has proven is that none of them belong in the White House. The only difference between the people on stage is that one is supported by we the people, not by establishment interests. He's also the only one to receive more cash donations from active duty military than everyone else combined. Ron Paul. There is no one else. Itzda, I must respectfully disagree. Mr. Paul has serious problems, and there are others on that stage, and at least one not on that stage, who represent the people. Ron Paul is just plain wrong and clearly unfit for office. PERIOD. He's yet another big government tax and spender. All anybody needs to do is take a serious look at his Congressional record to see that's true. Earmarks. Lots of earmarks. To say he spends the tax payers money like a drunken sailor would be putting it mildly. If drunken sailors spent money like he does. They would own the Navy lol. Then there's his foreign policy. Which is naive to say the least. Foolishness and cowardly are more fitting terms to describe it. Lets take all our forces from around the world. Bring them all back. Close all our military bases. Stick our heads in the sand and pretend all our problems will go away. WRONG. Making us appear weak to those who hate us will only embolden them. Not make them go away. Sarah is sure to be the only one who once she gets elected will make progress on day one. Heck , she is already making progress. I know she already has a "to do" list and she will hit the ground running. We will see a different Sarah Palin this time around, because she does not have McCains people with their foot on her neck. She is gonna come out swinging. And she has sooooo much ammo on Obutiwanttobekiing that he will not know what hit him. The key is to discredit him as much as possible before they meet head on. Actually he is doing a pretty good job of that. I just can't wait.